﻿ Getafe 1-5 Real Madrid. Not giving up on La Liga! 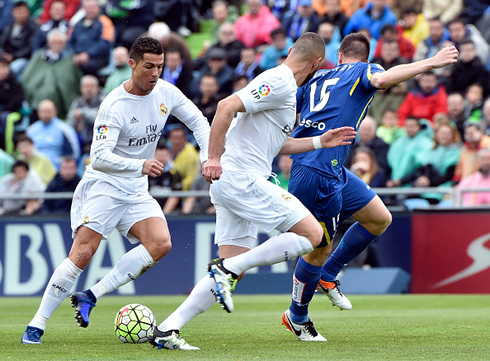 16.04.2016 » Getafe 1-5 Real Madrid. Not giving up on La Liga! With one game in hand, Real Madrid have now moved to 2nd place in La Liga and are now only 1 point behind Barcelona. This Saturday, the Merengues visited the Coliseum to comfortably beat Getafe 1-5 and extend their winning streak in the league to 7 games. Benzema, Isco, Bale, James and Cristiano Ronaldo secured the 3 points with a goal each. Real Madrid keeps chasing Barcelona and Atletico in these finals stages of La Liga this season and they just added another brick of pressure on their backs. Zinedine Zidane's men kept their high pace game in today's visit to their neighbours Getafe and beat the hosts 5-1 thanks to goals from Benzema and Isco in the first half, followed by Bale, James and Cristiano Ronaldo strikes after the break. The Portuguese star scored his 31st goal in the league and his 47th in all competitions this season. For now and at least until Barça and Atletico Madrid play their games tomorrow night, Real Madrid are second in the league just 1 point adrift of Luis Enrique's men. Despite Getafe's form over the past 12 games, after the high of the Champions League today's Madrid derby could have been a potentially dangerous game. However, Real Madrid took control after half and hour and never looked at risk at the Coliseum Alfonso Pérez, winning 5-1 away from home and keeping the pressure on Barcelona. 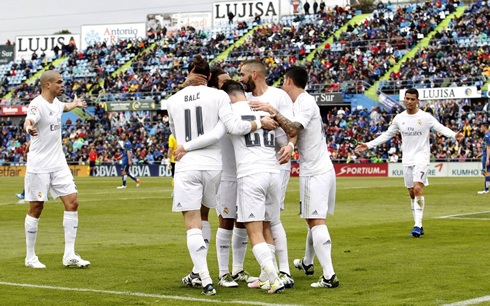 Everyone got into the act today, with Isco and James both in the starting lineup and on the scoresheet. Benzema opened the scoring and he was quickly followed by Isco, Bale, James, and eventually Cristiano Ronaldo. That's five different goal scorers in total. The win puts Madrid within one point of Barcelona, who face a reinvigorated Valencia side tomorrow night. One player who certainly deserves plaudits is Isco. After an inconsistent season and recent rumors of a move to Juventus, Isco was able to show today why he's such a highly regarded talent. His goal was brilliant, but all game long, he played the midfield role to perfection. It was a good showing for James as well, his goal was taken so calmly in the box. Both players are important and ultimately fresh. It's great to have such readily available talent on the bench during the crunch time of the season! All in all, it was a rather comfortable win for Real Madrid, who now prepare to take on a difficult Villarreal side next week on Wednesday, with their league hopes hanging in the balance. 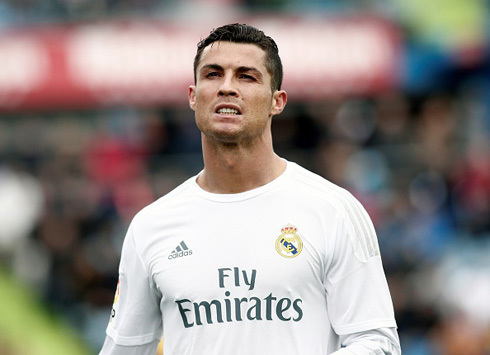 Cristiano Ronaldo next game with Real Madrid for La Liga is on April 20 of 2016, against Villarreal. You can watch Juventus live stream, Real Madrid vs Villarreal, Barcelona vs Valencia, Bournemouth vs Liverpool, Arsenal vs Crystal Palace, and Leicester City vs West Ham, all matches provided from our live streaming football game pages.